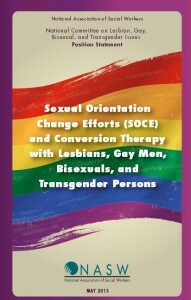 As advocacy efforts have grown, both for and against the use of sexual orientation change efforts (SOCE) and conversion therapy, so has the need to educate clients and communities about the impact of these practices on individuals and families, and the implications for social work practice. To help guide practice, the National Association of Social Workers (NASW) has issued a Position Statement entitled, Sexual Orientation Change Efforts (SOCE) and Conversion Therapy with Lesbians, Gay Men, Bisexuals, and Transgender Persons. The updated Position Statement was adopted by the NASW Board of Directors in May, and is now available on the NASW website. NASW reaffirms its stance against reparative therapy and other sexual orientation change efforts (SOCE) designed to change sexual orientation or to refer clients to practi­tioners or programs that claim to do so. NASW condemns the use of SOCE or so-called Reparative Therapies by any person identifying as a social worker or any agency that identifies as providing social work services. Public dollars should not be utilized for programs that support SOCE. Does this apply to social workers engaged in Christian counseling for adult clients who seek this type of treatment? I just learned in a workshop at the Human Rights Campaign Time to Thrive Conference that most states and municipalities do not prohibit conversion therapy by mental health practitioners, licensed or otherwise. This clearly violates multiple ethical codes of conduct and I encourage all social workers to advocate for legislative protections in their states and, if permitted their counties or cities. The latter is not ideal but a start. “Conversion therapy” was being practiced by a man in Jersey City who I have known for decades. I am reluctant to say more here, except that his wife assured me he IS successful. I am strongly opposed to his ideas and practice, if he is indeed still practicing. I believe he was disbarred from practicing law & has a record. He has no relevant degrees in human services that I know of, but then, I have kept my distance, especially since hearing of his enterprise which he carried out internationally. I’m not familiar, in any way, with the concept of SOCE and/or “conversion” therapy. Does anyone have any evidence that a person voluntarily sought such treatment? If so, is there any quantitative or statistically-significant research findings that would support or refute this practice? Do the position statements include only involuntary clients? If so, I support such. I just did a brief literature review. To date, there is no scientific evidence to support conversion therapy with any client, regardless of reason to seek treatment. The evidence shows there is more harm to the client and is ethically opposed by the APA and other professional associations. NASW is echoing this position and has my support. How can anyone convert sexuality? force it into a one size fits all category? Its fluid…not meant for the social workers alphabetized filing cabinet of therapeutic interventions anyway. Of course these “faith-based” churches in america, treatment centers for gay and lesbian “conversion therapy” should not be endorsed by NASW. Its the only sane stance they should take. Money, lobbying and attention need to be focused on real issues like how We are all basically screwed as long as the planet is run by untreated mentally ill dictators in government, church and corporations. Thank you for a very clear and a very important position statement! I like what I read, keep the great work going.